Commercial roofing systems can be replaced without rebuilding them from the bottom up through a process called resurfacing. As your leading roofing and siding contractor in Northern New Jersey, Up and Above Contractors takes a look at how resurfacing material is matched with existing commercial roofing. Traditional commercial roofing is built with several layers, often consisting of loose aggregate like pebbles or gravel. Roof replacement can be costly if you were to replace the roof all the way down to the substrate. This can easy enough – and cheaper – with membrane roofing like TPO or EPDM as there is only one layer to remove. Loose-laid roofing only takes hours to remove and prepare for replacement. Bituminous systems are not built like membrane roofing, so the next best option is resurfacing the existing roof. 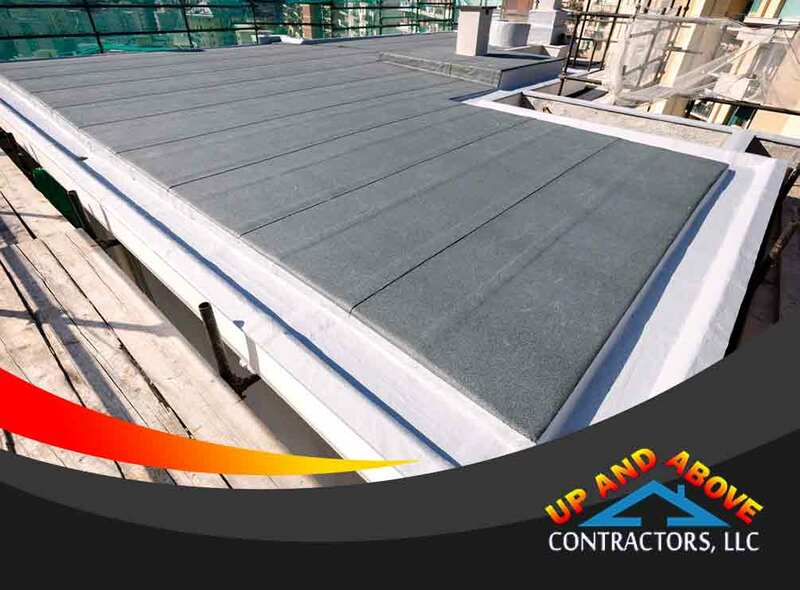 A capable commercial roofing contractor like us will have the capability to match the existing roof with the new one if this is a requirement. For other roofing systems, protective coatings made of epoxy or silicone are added to ensure waterproofing as well as stiffness and durability. The actual process differs per roofer, but most resurfacing work begins with pulling off as much of the unwanted and damaged components as possible. Loose aggregate is removed using an industrial-grade vacuum cleaner. The remaining roof is then tested for leaks and repaired. For partial replacements, the same or a similar material is sourced for replacement. Various types of bituminous products can be used on traditional roofs, from hot asphalt to reflective asphalt-aluminum coats. Modified bituminous systems may be heated at specific temperatures to melt the existing layers of bitumen, merging the repaired sections with the remaining parts. A fresh layer of bitumen, followed by new gravel, coating or other types of outer roofing material, will then be applied. To learn more about roof resurfacing or if you’re looking for a contractor who offers quality replacement windows and doors, call Up and Above Contractors today at (973) 531-4225. You can also fill out our contact form to schedule a free estimate.